The benefits of honey are well known for health and beauty. Sweet liquids produced by these bees were eventually used as a traditional medicine that is believed to cope with various conditions. Is it true that the benefits of honey if viewed in terms of medical? The content of honey consists of several ingredients, such as water, sugar, antioxidants, flavonoids, phenolic, vitamin E, vitamin C, amino acids, and some minerals such as zinc and iron. People often take advantage of honey as a medicine to relieve a cough, allergies, diarrhea, and asthma. Not only that, but some people also use it for various skin problems, such as relieve itchy skin and heal wounds. Benefits of honey were also good in the handling of diabetes. Some studies have found that eating honey every day can lower blood sugar levels in diabetics. Not only that, the cholesterol and weight of diabetics can also decrease due to the benefits of honey. But so far still need to be investigated further about what kind of honey is the best use to help treat the condition. Some studies say that the sweetness in honey can trigger the production of saliva and mucus. It can soak the throat so that it relieves a cough. Eating honey before bed may reduce coughs in adults and children aged two and up. You can try applying processed honey or cream containing honey on the wounded skin. 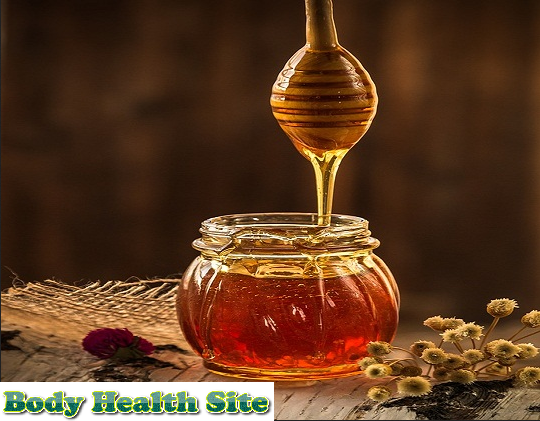 Nutrients and other chemicals in honey are believed to accelerate wound healing by reducing pain, reducing infections, improving the performance of the cells involved in wound healing, reducing pus, and unpleasant odor of the wound. The types of wounds that may be cured by the benefits of honey are burns, abrasions, postoperative wounds, and ulcers or chronic foot ulcers. The results showed that honey was not proven to treat acne. Eating honey about 20 ml may reduce the severity of canker sores, as well as weight loss and pain during swallowing due to radiation therapy in the treatment of head and neck cancer. Research shows that patients who were given honey post-radiation therapy in the head complained of a milder pain than those who did not. Several recent studies have shown a positive effect of the benefits of honey for some of the above conditions. However, to strengthen the scientific evidence, further research is needed with better population samples. Relieve the condition after eye surgery. Treating skin irritation from sunburn. If consumed and applied to the skin with the right dose, honey is generally safe. Children over one year of age may consume honey. But you should avoid giving honey to babies or children under the age of a year to avoid the risk of botulism. Botulism is a condition of poisoning that attacks the body's nerves and is potentially fatal. But it must be noted that not all honey is safe. There is also a type of honey that has a harmful effect if consumed, namely the type of honey derived from Rhododendron nectar. This type of honey is at risk of causing low blood pressure, chest pain, and heart rhythm disturbance because it contains toxins. The possibility of honey safe for pregnant and lactating women. But for the sake of safeguarding the Little, better pregnant and lactating mothers avoid the consumption of honey. For those of you who have a pollen allergy, better avoid eating honey because this sweet liquid is made from pollen that can cause allergic reactions. If you want to consume and feel the benefits of natural honey. Note also the expiry date listed on the packaging. If in doubt, consult your doctor about the benefits of honey for treatment and to maintain your health condition. 0 Response to "Benefits of Medically Honey"